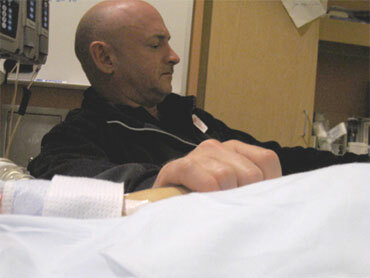 Rep. Gabrielle Giffords' husband, Mark Kelly, has been keeping vigil by her bedside since she was injured in the Tucson shooting a week and a half ago. He told CBS affiliate KOLD in Tucson that he believed for about 20 minutes that his wife was dead after seeing a mistaken television news report. "I had the TV on and then saw that she she died, for about 20 minutes," Kelly recalled. "I just, you know, walked into the bathroom, and you know, broke down," he told ABC News in a separate interview. "To hear that she died is just, it's devastating for me." Kelly said he later learned that she was alive when he called Giffords' mother, who was outside the operating room. Giffords' husband, an astronaut for NASA, said turning on the TV was a terrible mistake, but that learning his wife was alive was exciting news. Kelly told ABC that Giffords had a prescient feeling about the, telling him some time before the incident: "Someday I'm really worried that somebody's going to come up to me at one of these events with a gun." Kelly told KOLD that while Giffords knows she's in a hospital, she doesn't yet know how she got there. "I have talked to the doctors about that, they say the best thing to do in this case, with this kind of situation, is not to tell her about all of it at once but when she starts asking questions about it, just answer the questions," said Kelly. When asked if he thought that the political climate was partly responsible for the attack, Kelly said, "[The climate] didn't cause Jared Loughner to, you know, to plan this attack… I think you have somebody that's really, really disturbed, possibly schizophrenic." Giffords was shot in the head Jan. 8, 2011, outside a grocery store in Tucson where she was holding an event to meet constituents. Six people were killed and 14, including Giffords, were injured. Jared Loughner was arrested and charged in the crime. Kelly said doctors are cautiously optimistic that his wife can make a 100 percent recovery, though he admits that is only a hope in his own mind. When asked if Giffords was able to recognize him, Kelly replied, "I'm pretty sure she does… certainly today." He went on to describe the way Giffords played with his wedding ring Tuesday and said that was something she'd done prior to the shooting. "She does that all the time. She'll do that if we're sitting at dinner in a restaurant," he said. Kelly has said Giffords smiled at him just days after she was shot. CBS News correspondent Ben Tracy reports that, inspired by her remarkable progress, Kelly has even set goals for his wife's recovery, designating a date by which he hopes she'll start speaking again. "Well, I put her on a schedule. I whispered the schedule in her ear and I've told the neurosurgeons what I want her to be able to do by then, so she knows what that it is, she's very good with plans and schedules and she's a very hard worker." "I'm going to walk out of this room, and I'm going to go back to [her] side," said Kelly of his plans immediately following the ABC interview.